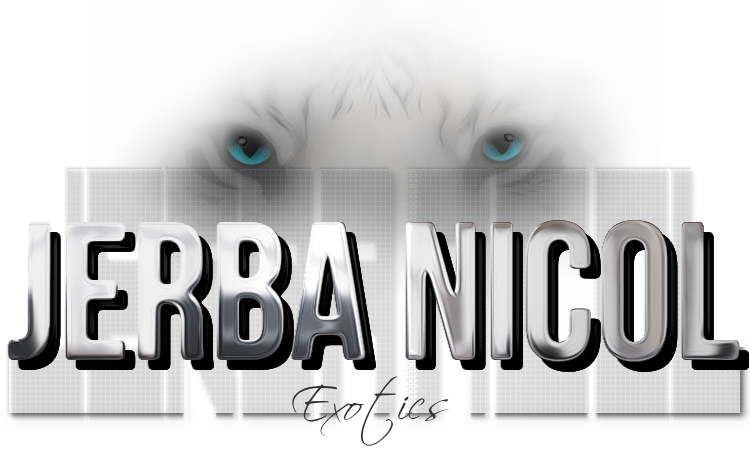 Hi, my name is Karin Broeders, owner of the JERBA NICOL cattery. We are located in a beautiful town called Kampen, situated in the Province Overijssel in the Netherlands. My son Julian and our two pekingese dogs Sasha and Macy are the main kitten socializers in the cattery. Jerba Nicol is a CFA (Cat Fanciers' Association) registered cattery since 1994, and an independent registered cattery since 1986. My cattery is small, and I only breed a few litters a year. 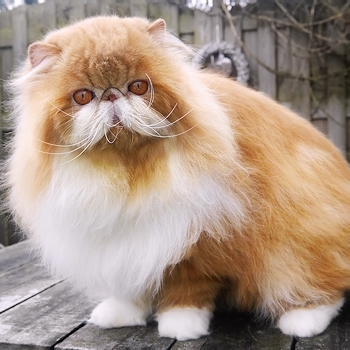 My cats and kittens come from the best Grand Champion, Breed winner, Regional winner, National winner and Distiguished Merit Persian and Exotic lines! My cats and kittens are registered and shown exclusively in CFA and meet the standard for their breed! I specialize in bi-colors but occasionally have tabbies, whites and solid colors. With each litter my ultimate goal is to create wonderful show cats with cobby and massive body & legs, big wide open and dark copper eyes, small ears, round round head, smooth doming, and a sweet open expression... which should be typical for a Jerba Nicol cat. I aim for cats that not only meet their breed standard, but also for healthy cats with a strong constitution and a good personality. Of course all of our cats and kittens are PKD negative (we have been PKD testing our cats and kittens via scan since 1998 and up, as well as via DNA since 2005). Our cats are members of the family (no cages), meaning they have the run of the house and sleep in our beds. Our kittens are born in my bedroom and as soon as they're old enough they get the run of the house together with the rest of the cats where they are well socialized. They are raised underfoot with plenty of love and attention. 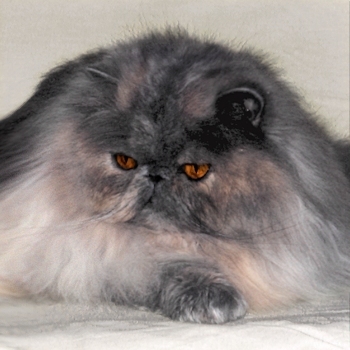 I bought my first pedigreed cat in 1984, a Cream Persian male, named Sjoerd van Flossy's Home. Not long after that I bought a tortoiseshell female, named Artimis van Slavenburg. 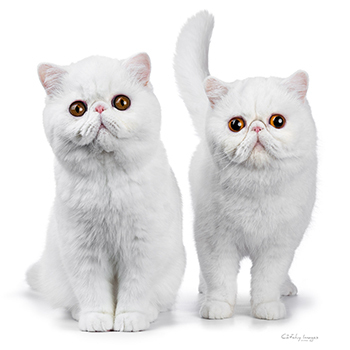 With these two cats I started breeding Persians. The breeding of Bi-colors, including Vans (in The Netherlands we also have 'Harlequins'), started in 1988 after I bought a black and white girl named Eur.Gr.Int.Ch. Jerry of the Purple Rain, aka Miesja. I always thought that I loved solids, 'till my black and white girl gave me 4 wonderful babygirls... including 2 lovely Vans! I totally fell in Love... so from that moment I decided to get specialized in Bi-colors and especially in Vans. This still is my challenge these days! Like an old story says... old love never dies. Also Miesja was the cat who gave me my first Exotic litter. Jerba Nicol's Danyo-Douè was one of them. A sweet n' stunning blue boy, born in 1991. And you probably know what happened... "the Exotics ruled the house"! I just love them as well as they are a lot of fun to live with! Together with the Exotics... there of course was created a new love as well: The Van (and/or Harlequin/High white) Exotic!!! It took some time, but finally my first Exotic Van was born in 1996. I called her CH/Int.Ch. Jerba Nicol's My-Dreams-Desire. She was out of Ch. Jerba Nicol's Sonny-Go-Steady and CH/Eur.Gr.Int.Ch. Jerba Nicol's Never-Say-Never. My first import cat arrived in 1992, after I met Sue Fraser and Larry Rhoades of the Lion House Cattery at a cat show in California, USA. Their beautiful blue-cream Exotic Longhair girl Eur.Gr.Int.Ch. Lion House-Shamu of Jerba Nicol, became one of my most important foundationcats. Thank you Shamu... I'll never forget you! A few years later I also purchased CH/Int.Ch. Lion House D.J.Jovi of Jerba Nicol, a gorgeous red tabby-white Exotic boy who turned out to be homozygous for shorthair. Both Shamu and D.J. are the ancestors of many of our current Grands, Divisional Winners, Regional Winners and Best in Show, Best of Best & Best over All Winners. Hereby I gladly would like to mention the following cats who, besides my own breeding stock, have been very important for my breeding and showing program through the years: Int.Ch. Kall 026, Russian Roubles of Jerba Nicol, CH/Pr. Katyiah's Rhapsidy of Jerba Nicol, Int.Ch/Pr. Tocambar's Ice Bear of Jerba Nicol, Int.Ch. Ixiolirion's Bubbles of Jerba Nicol, Phailin's Day Dream of Jerba Nicol, Ch. Aimée's White Wish of Jerba Nicol, GC Floricats Work of Art of Jerba Nicol, CH/Gr.Int.Ch. Marquardstein Sylvia of Jerba Nicol, CH/PR/Int.Ch. Brettonpark Cotton Eye Joe, CH Floricats Blondie of Jerba Nicol, Int.Ch. Athelstones IceCream of Jerba Nicol, CH Maradan Gold Fever of Jerba Nicol, CH Calivan's Ice-T of Jerba Nicol, CH Mockingbird X-Sampa of Jerba Nicol, Athelstones Nine Inch Nails, CH Psymis Celina of Jerba Nicol, Du Marais Ginger of Jerba Nicol, Maradan Bamboleo of Jerba Nicol, GC/Gr.Int.Ch. Soulstone's Candy-C of Jerba Nicol, LT*Lelija Zumba & Apollo, GC/Gr.Int.Ch. Pouspardoux Dixy Doudle, Pouspardoux Whoupy of Jerba Nicol, Carinazot Hollywood of Jerba Nicol, CH Gargamelcat Bonita of Jerba Nicol, Arcobaleno Flipper of Jerba Nicol, Arcobaleno Fancy of Jerba Nicol- and not to forget my everlasting loves... GC, DW/Eur.Gr.Int.Ch. Brettonpark Big Hug of Jerba Nicol & GC Maradan Mecachis of Jerba Nicol! They all made the Jerba Nicol cats as beautiful, sweet and succesful as they are today! And of course... I can not let out our current welcome addition: Myeu's Tabasco of Jerba Nicol. All these cats are a great access to Jerba Nicol's show and breeding program! Huge thanks to all my friends for sharing their beautiful cats with me, for entrusting me with their great bloodlines, for their support, and... for making my dreams come true! I hope you enjoy reading about and visiting our cattery. Please come by often to check for updates, and feel free to mail or call me with any questions. I will be happy to answer them. Thank you for visiting our website! We are looking forward to hear from you! Jerba Nicol's website was established on September 28-2001. Designed and maintained by Karin Broeders. All images, photographs and text on this website are the sole property of Jerba Nicol and may not reproduced, copied, modified, adapted, or otherwise used without the prior written consent of Jerba Nicol, unless otherwise indicated. Copyright © 2001-2018 Jerba Nicol Cattery. All Rights Reserved.